iRobot announced last week that it would be offering the high-end Roomba 960 for just $500 for Black Friday 2018. That’s a fantastic deal considering the 960 is one of the best premium robot vacuums ever made, and it normally sells for $700. As good as that deal is though, you definitely shouldn’t bite. Why not? 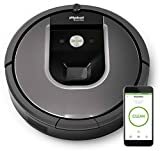 Because if you buy the iRobot Roomba 960 Robot Vacuum with Wi-Fi Connectivity right now on Amazon instead, you’ll save an extra $50 and only pay $449! That price is unbeatable, and there’s a very good chance it’s going to sell out so grab one now while you still can. Also of note, if you want an Alexa enabled Roomba but you don’t want to pay quite that much, the Roomba 690 is on sale at an all-time low aw well right now on Amazon.